Fr Franck Quoëx passed away on January 2, 2007. He is remembered not only for his important work as a scholar, but, I would dare say, even more for the way his dedication to the liturgy, his example as both a celebrant and a Master of Ceremonies, taught so many people, both clergy and laity, to love the traditional rites of the Church. This was almost the first thing I ever published on NLM after officially coming on board as a writer. Today is the third (now ninth) anniversary of the death of Fr. Franck Quoëx, a priest of the Diocese of Vaduz in Lichtenstein, and one of the foremost liturgists of our times. I had the great honor to serve alongside Fr. Quoëx at the traditional Masses in Rome for many years, and some of the most beautiful rites I have ever seen were put together and guided by his phenomenal expertise. He had and deserved a reputation throughout Europe as a highly talented Master of Ceremonies; many have remarked that if the Pope should ever decide to do the ancient Papal Mass again, Fr. Quoëx would have been one of the few people who could have arranged it properly. I am always put in mind of him most especially during Holy Week; he had a great love of these most solemn rites of the Church, and the rehearsals he led were filled with interesting asides on the origin and symbolic meaning of the ceremonies. In the year 2000, he was the first master of ceremonies for a Rorate Mass celebrated by His Eminence Alphonse-Maria Cardinal Stickler, at the church of San Pietro in Montorio. Like most of the servers, I had never been involved in Pontifical Mass before, and we were all extremely nervous; Fr. Quoëx steered us through a magnificent ceremony with grace and calm. In 2005, I was master of ceremonies for a Requiem Mass celebrated on behalf of Pope John Paul II at the F.S.S.P.’s former Roman chapel, San Gregorio de’ Muratori; my two very small mistakes were immediately spotted and corrected by Fr. Quoëx. He always behaved with the most perfect courtesy to myself and the other servers, and his criticisms, if I can even call them such, were easy to bear, because they were not born from a lack of charity, or a desire to lord over others. They came, rather, from a profound liturgical piety, and love of the Church’s tradition, even in its smallest details, which permeated his whole life as a priest. His own Masses, whether sung or read, were a lesson to all who saw them in devotion to the sacred liturgy, and he rejoiced to see the growing interest in the Tridentine rite among priests and seminarians in Rome. The Fraternity of Saint Peter’s European seminary, at Wigratzbad in Bavaria, was blessed to have him for some years as a professor. His knowledge of the sacred rites was both practical and theoretical; among his scholarly achievements, his thesis on the virtue of religion in the writings of St. Thomas earned the praise of Cardinal Ratzinger, and he edited and published out of the Sorbonne critical editions of the liturgical codices of the use of Vercelli, in northern Italy. In May of 2006, Abbé Quoëx was diagnosed with cancer, which took his life less than nine months later. In the final days of his illness, when he had become too weak to celebrate Mass, he would have friends sit at his bedside and read the Mass to him. He passed away at the age of thirty-nine, on January 2, the feast of the Holy Name of Jesus, and is buried in the cemetery of Lausanne, Switzerland, where he had been serving the faithful of the traditional Mass community. The joy of his eternal rest has most surely been increased beyond measure by the promulgation of the motu proprio Summorum Pontificum, and the flourishing of the traditional Mass to which he dedicated his all-too-brief life in this world. The legacy of the Lord, the Mass is the Sun of our lives and our treasure. We love it due to the fact that it is substantially and principally of the Lord's [own] institution. But we love it also as the Church, to which Jesus entrusted its celebration, has transmitted it to us down through the centuries by means of the various liturgical traditions. Because the prayers and rites developed through the centuries in order to explain and manifest before the eyes of the entire Church the unfathomable riches of the essential rite bequeathed by the Lord. ... We cannot in any way forswear a heritage slowly built by the faith of our fathers, their burning devotion, and the theological reflection around the sacrament of the Passion of the Lord. In contact with the Mass of Saint Pius V -- in which we also contemplate the purest masterpiece of Western Civilization, hierarchical as well as sacral -- our souls lift up and our hearts expand, while our minds taste the most authentic Eucharistic doctrine. This is why we wish to understand and love, at all times more, the Traditional Mass, our treasure, and we will not cease to defend and advance it. 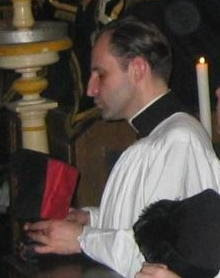 Le Baptistere, March 2003; translation courtesy of Rorate Caeli. Photo courtesy of Orbis Catholicus.